The yellow Corvette returned to victory lane at the Rolex 24 at Daytona after Antonio Garcia, Jan Magnussen and Ryan Briscoe drove their No. 3 C7.R to a GTLM class victory Sunday. The race marked the Corvette Racing’s second return to Daytona following its historic class victory in 2001 in the C5-R. In addition to taking home a class victory, Corvette Racing’s No. 4 car, driven by Oliver Gavin, Tommy Milner and Simon Pagenaud, finished third in the race behind the BMW Team RLL No. 25 BMW Z4 GTE. The No. 4 car, which started from pole position following a blistering qualifying session from Gavin, was in good position to win the race, but lost four laps after making contact with the No. 66 RG Racing BMW Dinan/Riley Prototype with only three hours remaining. The No. 3 car’s 24 hour session was less troublesome. Over the course of their 725 laps, which covered 2,581 miles, the No. 3 C7.R experienced virtually no problems, with Garcia saying their problem-free race is what helped them put the car at the top of the podium. The No. 3 C7.R led more than 360 GTLM laps in the hands of Garcia, Magnussen and Briscoe, and recaptured its lead with just 90-minutes left when the then-class leader experienced car trouble. A perfect pit stop for fuel and tires shot them further into the lead, and the C7.R crossed the finish line just 0.478 seconds ahead of the next fastest car. The win is Corvette Racing’s first podium since it finished 1-3 at the Long Beach race last April. The team now sits at the top of the Tequila Patrón Endurance Challenge rankings, an endurance series within the Tudor USCC’s season consisting of four 6-, 12- and 24-hour events. 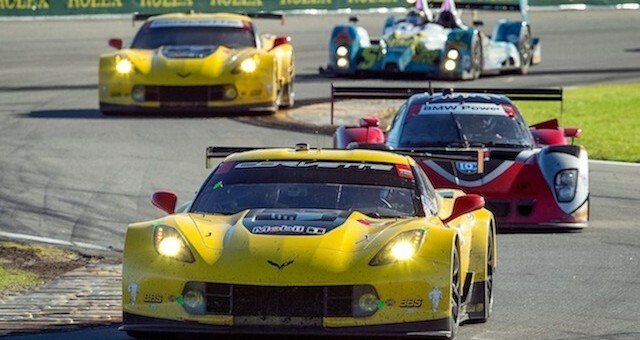 The series will continue on March 21 when the green flag drops on the Mobil 1 Twelve Hours of Sebring, where Corvette Racing will be in search of its second consecutive podium in 2015.